All that holiday stuffing got you feeling sluggish, bloated and uhh well…..constipated? Meet your colons new best friend, Adriana Vargas of Alivio (Spanish for Relief) Wellness. Adriana, originally from West New York and now living in North Bergen, started experiencing digestive issues during college which eventually led her to a more natural and holistic approach to healing. She left her career in Tourism to focus on helping others suffering from stubborn colon issues by becoming a certified colon hydrotherapist. So what is a colonic? Adriana explained the process to me: “I use the Woods Gravity Method which is the most natural and gentle method to clean the colon. The Woods Gravity Method uses purified water to gently cleanse the colon and remove waste”. This is different from an enema because it has the ability to get much further into the colon and clean out toxins. The entire process takes 45 minutes to an hour. Fun fact; the colon is about 5 feet long! So even if you are pretty regular Adriana explains that it’s wise to get colonics a few times a year to clean out all that waste that your body isn’t dispensing on its own. She recommends at least once each season, or if you are “detoxing” do a colonic before, during and after detox. There are a few things you need to do to prep for a colonic; two days prior cut out meat and dairy and incorporate more leafy greens and natural juices. No eating 3 hours prior to your colonic treatment and no drinking 1 hour prior. Although the Woods Gravity Method used at Alivio Wellness is 100% natural there are some people that should not get colonics so it is recommended to consult with your physician prior to getting a colonic. Additionally, you can read more about conditions that prohibit treatments as well as more about Adriana and Colon Hydrotherapy on Alivio’s website here and on Instagram here. So, go ahead, indulge! It is the holidays after all, so feel good knowing that relief or “alivio” close at hand. Kathleen Callahan is a NJ native, having left New Jersey to attend college at the University of North Carolina where she obtained her bachelors in Communications. She now resides in the heights section of Jersey City. After spending a twenty year career in the Ad Tech industry working in NYC, Kathleen decided to follow her true passion, skincare. She attended Atelier Esthetique Institute of Esthetics and obtained her Esthetics License. After working at several spas in NYC including Deify Beauty, Laser Lounge and Massage Envy she decided to start her own practice in New Jersey where she could focus on a more personal touch catering to her clients’ specific needs and preferences. You can reach Kathleen through her Instagram or Facebook. I generally try to stay in Hudson County for our featured businesses, but when offered the opportunity to play in the "World's Largest Halloween Store", I'm certainly not going to turn it down. Plus I think every Hudson County-er can handle a 20 minute drive. Family owned and operated, the State Fair brand is also behind State Fair Meadowlands (your favorite NJ State Fair), and certainly understands entertainment for the whole family. Walking into State Fair Seasons Halloween, is like walking into an absolute Halloween wonderland. It's the kind of place where I'd happily spend money with reckless abandon. Firstly, it's HUGE! Take about three of your NYC Halloween pop-up stores and maybe that will give you an idea. It's also open all year long-- some of the inventory may be switched to cater to Christmas or the Summer pool season-- you can always expect to find a good amount of costume inventory. When I meet store representatives Steve Solomon and Michelle Tartaglione (a part of the family that owns State Fair) in the store, they're lovely and excited to show me around. I'm ready to dress up, because, well, there are few things that get me as excited as dressing up. We start at decorations that span from small rubber spiders, to life-size animatronic scary women that evil-y cackle with fervor. There are aisles of tombstones, ghosts, scary things that make noise, you name it. Next up we check out the mask/ hat/ wig wall. Rest assured, I'm not lumping these in together because there isn't enough inventory-- in fact there's so much it takes up three major walls in the store. Masks span from licensed characters like the South Park kids and Avatar, to scary, to weirdly obscure turkeys and hairless cats. Not to mention there're hundreds of different hats and wigs that will work any costume you're planning. The store is stocked with costumes and accessories for everyone in the family from infant, to Plus Sized Adult, to pets. They have couples costumes, costumes for the whole family, and not to mention the kids section is a whole entire separate room. There're shoe walls, aisles of accessories, walls of pantyhose and tutus, and basically anything you could possibly need. Want to build a costume from things in your closet, and just need a few chosen accessories? State Fair has it. Need a full deluxe costume with alllll the trimmings? This is your place. 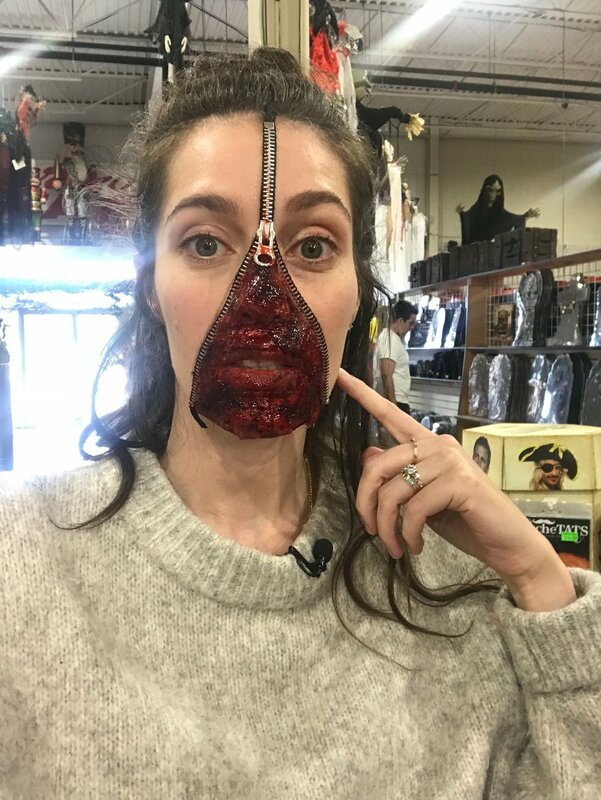 On top of all of that, they invite local makeup artist, and also part of the State Fair family, Catherine Cramer to do Halloween makeup tutorials. I definitely walked in not knowing what to expect, but hoping it was going to be the kind of gory makeup I've always tried to accomplish, but lack the skills to achieve. Catherine delivers and then some. Through a special effects zipper piece, cotton balls, liquid latex, fake blood and Ben Nye makeup (did I mention the makeup selection is extensive? ), she managed to make my face look like it was coming undone. I was so happy I drove home with my makeup on. Make sure you check out State Fair Seasons for all of your last minute Halloween costume and decorating needs, as well as their website here and their Instagram here. And don't forget to follow Catherine here, where she's doing her #31daysofHalloween challenge and ABSOLUTELY KILLING IT! Last weekend I got to bring my 11 month old and husband to the State Fair Meadowlands at MetLife Stadium. I used to go when I was younger, so I was very excited to share this experience with my son. Though the times have changed, not much about the fair has, and that's not a bad thing. If you're looking for entertainment, the shows are great. We really enjoyed Rosaire's Royal Racing Pigs, run by 5th generation circus family, The Rosaire's. I wish I could say just the baby was entertained by pigs running around, but I found myself cheering them on as well. There's also the Sea Lion Splash, an educational show featuring rescued sea lions, Arctic Olympic High Dive Show, with towers and dives so high it's certainly not for the faint of heart, the Cycle Circus Live, which is your standard, but very exciting caged motorcycle show, and magic/illusion shows, Extreme Illusions and Escapes, Art of Magic and Belmont Festival of Magic. There's also a petting zoo, which had camels, llamas, kangaroos, goats, donkeys and sheep, and probably topped the list of my sons favorite thing at the fair. You can't have a fair without the rides, and all your favorites are there. There are ferris wheels, carousels, rollercoasters, tilt-a-whirls, flying chairs, fun houses, etc. There's a children's area called Kiddy World where we spent most of our time on every ride where you can sit and ride with your child. But the main attraction to the fair always has been and always will be the food. 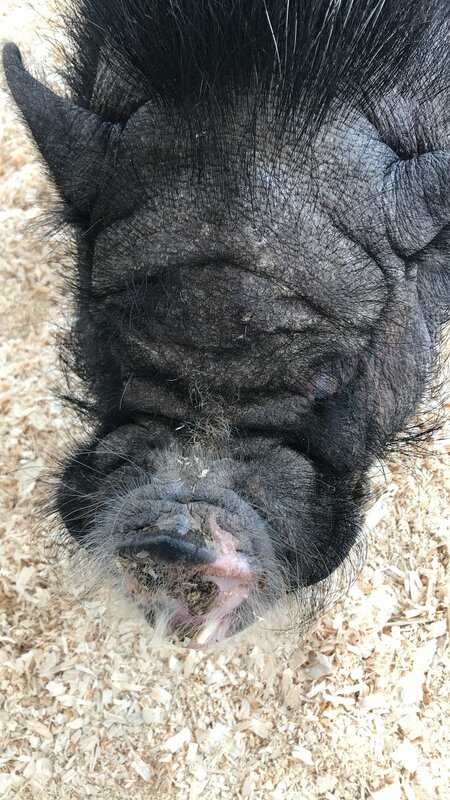 This years fair featured rolled ice cream, which is pretty much exactly what it sounds like, Dragons Breath, a cup of cheese-puffs and Froot Loops frozen with liquid nitrogen, that makes you blow out smoke when you eat them, and a bacon stand, where you can eat DELICIOUS bacon in every form. I think I'm more of a fair traditionalist though, choosing funnel cakes, gyros, deep fried Oreos and zeppolis. Spaghetti Eddie's is where it's really at though, a stand that's been in existence at the fair for 33 years, serving you a FULL Italian meal (think lasagna, ziti, and OBVIOUSLY spaghetti and meatballs) with a side salad and bread for $7. No matter what your favorite part of the fair is, it's all at State Fair Meadowlands. If you're looking for a cheap activity this weekend, Saturday July 2nd, is Cheap, Cheap Night where all tickets cost $5. If you want more of an all encompassing ticket, you can get a MegaPass for $25 that includes your gate admission and a pass for all the rides. Maybe you just need a place to watch July 4th fireworks, the fair has got you covered on July 3rd and 4th. Anyway or day you make it, State Fair Meadowlands is a great time for your whole family!